Tagines are usually the main dish in Morocco, but this vegetarian version works equally well as a side to meat or poultry. Chickpeas and carrots are stewed with piquant, aromatic seasonings including ginger, cinnamon and the exotically flavored ras el hanout. A touch of honey adds complementary sweetness. When a recipe calls for chickpeas, the vast majority of Moroccans prefer to start with dried chickpeas rather than canned. If you want to follow suit, allow additional time for soaking the chickpeas overnight, then cooking until tender. This may be done well in advance, as it's perfectly fine to freeze cooked chickpeas until needed. You have plenty of flexibility as to how to season the tagine. To add heat, throw in a chili pepper or two. For a sweeter presentation, increase the honey and include the optional raisins. Using half broth instead of all water will add depth of flavor, but be sure to watch the salt. 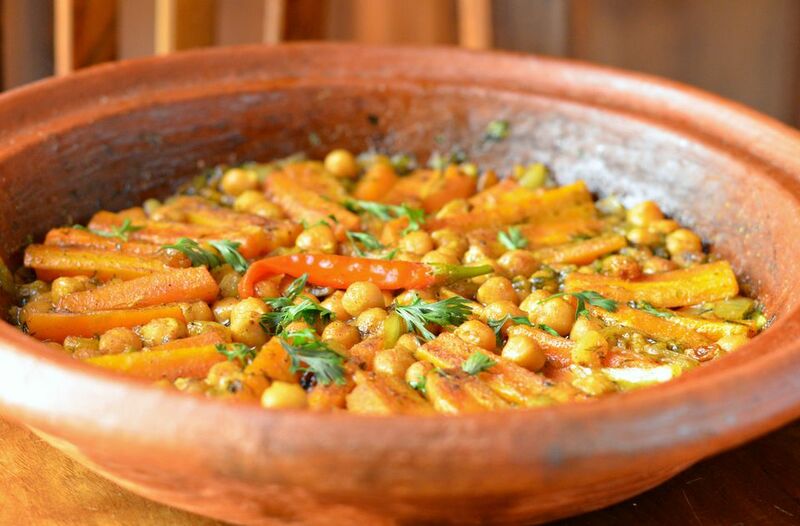 Although tagines are typically served with Moroccan bread for scooping everything up like a dip, you can break tradition and serve the chickpeas and carrots over a bed of rice or couscous. In the base of a tagine or in a large skillet with a lid, sauté the onions and garlic in the olive oil over medium-low heat for several minutes. Add the salt, ginger, turmeric, cinnamon, black pepper, cayenne pepper, ras el hanout, parsley or cilantro, carrots and the water. Bring to a simmer over medium-low heat, then continue cooking, covered, until the carrots are nearly cooked to desired tenderness. In a skillet, this may take up to 25 minutes, in a tagine a bit longer. Stir in the honey and add the chickpeas and optional chili peppers and raisins. Continue simmering until the chickpeas are heated through and the sauce is reduced and thick. Taste, adjust seasoning if desired, and serve garnished with parsley or cilantro. If cooking in a clay or ceramic tagine over a heat source other than gas, you'll need to use a diffuser between the burner and tagine. Instead of cutting the carrots into sticks or planks, they may be sliced on the diagonal or into rounds. Be sure to remove the core if it's dry and woody. A tagine will double as your serving dish. When adding the carrots, arrange them in a pattern for a prettier presentation. Harissa may be offered on the side as a condiment. Or, you can stir a little bit into the tagine in lieu of adding a chili pepper or cayenne pepper.